Tour the waters around St Maarten aboard a boat, including time for snorkeling, during this 4-hour excursion. With your friendly captain and crew, sail around Simpson Bay Lagoon to view the megayachts, then past Marigot Bay to Creole Rock. Splash into the azure waters for some snorkeling among the tropical fish and a variety of coral. 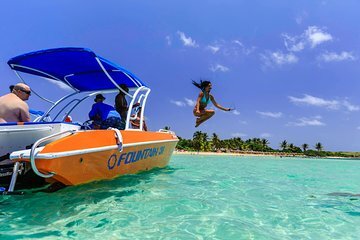 Cruise up the west side of the island toward La Samana beach for some fun in the sun and sand. Visit Maho Beach to watch the jumbo jets fly overhead. Onboard open bar, light snacks and round-trip hotel transportation are provided. This sightseeing cruise, with snorkeling and a visit to a beach was the highlight of our cruise. Our guide Kevin made it a wonderful adventure of exploring St. Maarten. The water was fabulous and the sights, both on land and under water were great! Highly recommended! We had a great time on our trip with Billy Bones tours! The Tour company does not have a shop in the Marina, so if you show up a little late, your guide may be looking for you. Do not worry, they will not leave you. Once we got on board, we had a great time. The snorkeling was a nice place to see a lot of fish. The tour was a lot of fun, I think the kids enjoyed the fast boat ride the most. The adults enjoyed the beach time with the floating bar while the sun kissed our faces. Great tour would do it again.